Most people will not understand what rattlesnakes have got to do with faith, or god or Christianity. It is very strange indeed that some people connect these deadly reptiles with anything that is spiritually based, but not a complete shocker that some people found a way to incorporate snakes into their belief system. In one of his brilliant talks Sam Harris talks about the power of faith and belief and how stupid it is of us to “respect” people who believe – or rather the belief itself. Not everything anyone believes is worth respect, in some cases it is worth nothing more then ridicule, and in the case before us it deserved (past tense) a stern warning that simply was not there – probably due, in part, to the fact that people are too careful not to criticize beliefs of other people. 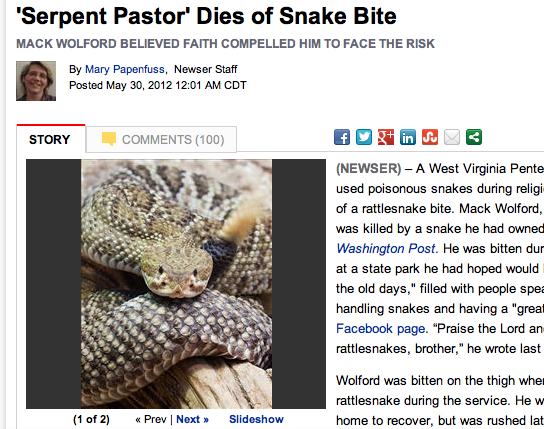 This is the sad and tragic story of pastor Mack Wolford, better known as the “Serpent pastor” for his belief that people should play with deadly snakes as a way to test their faith, a kind of a faith-o-meter that has got to have you on your toes at all time, because if your faith diminishes for any kind of reason you could very quickly die of a snake bite. There are many things I can doubt, but I have little doubt about the very high level of Mack Wolford’s belief, it will be safe to guess that it was as high as it can be in any person of faith. But faith did not save Mack, and if you read carefully you will also come under the impression that he was in no great rush to save himself once bitten, because faith should not only work as a shield to protect form bites (which it failed to do) but faith would also heal the bite by itself, without needing those crazy hospital things. Lets put things right and proper right here, there is in no way an attempt to laugh at this case, because the man had died of a snake bite. What was already a completely not normal situation in the fist place – having deadly snakes around, became an even more serious situation when the person got bitten, only to slowly get himself to a medical facility. Faith does not do that to people – Religion does. Religion feeds this monster and keeps it alive, these non sensical interpretations of what the bible tells us to do, what god wants us to do, how we should do it – gets people all kind of ideas, and since the big man is never around to make clear what exactly he wants us to do, well, these things just grow into these type of situations. Is it crazy that a man died because of a bite of snake that he had as a pet because he believed that god wanted him to do that? yes it is. Is it immoral for a 44 year old man to have this kind of belief without anyone in the church around him stopping him from literally killing himself on these basis – we guess not, because it seems to be more difficult to tell someone what he believes is nuts than to face and and say the truth.